Buying a gift for your favorite guitar player isn’t easy. If you don’t play the guitar yourself, you probably have no idea about what guitar players need and why. Getting a gift for your guitar player is fraught with the prospect of buying the wrong thing or buying something that is inappropriate for their age level. 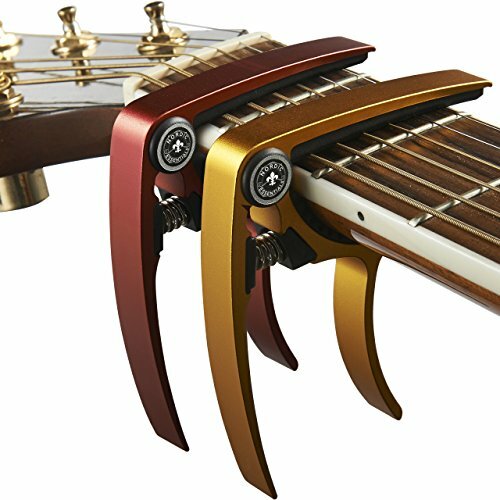 In this article, we’ll go over the top ten gifts for guitar players that are ready for you to purchase. You’ll quickly understand who the gift is intended for, what the purpose of the gift is, and whether your guitar player will be enamored with you when you deliver it to their doorstep. 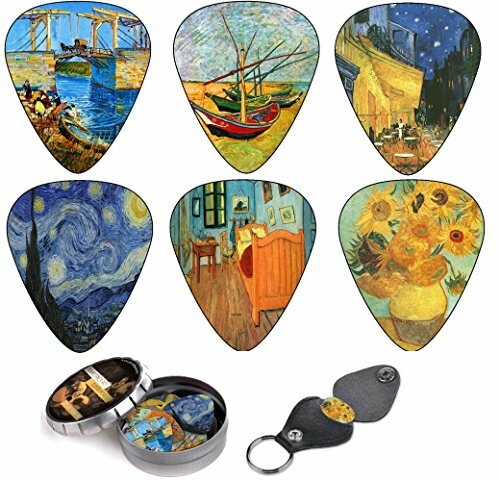 These Vincent Van Gogh Guitar Picks are an excellent choice to bring a dash of flair into your guitar player’s life. Each of the picks contains a beautiful scene from Van Gogh, ranging from his magnum opus, Starry Night, to his other influential pictures. You’ll get 12 separate picks contained in a trendy little tin box. You’ll also get a keychain which you can use to carry a pick so that your player will always have a pick with them no matter where they go. This pick set is great for the guitarist who has an interest in the arts outside of music. There are also a handful of other artists with their pick prints if you think your player would prefer something different. 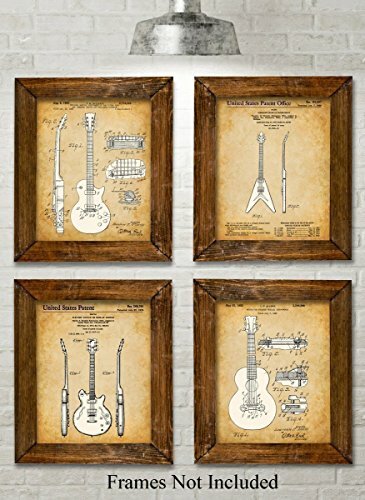 These Original Gibson Guitars Patent Art Prints bring a bit of beauty to your guitar player’s room or practice area. Each of the four prints contains an image of a famous guitar, complete with schematic markings and a little blurb about why the guitar is important to the history of music. Especially for guitar players that enjoy reaching back into the history of guitar music, these prints are an aesthetically pleasing gift. There’s nothing like a visual reminder of your favorite activity to spur you into action. The Think Out Loud Apparel Guitar Player Evolution is a great gift for your guitarist because it combines humor and fashion in a trendy package. On the shirt, you’ll find an evolutionary history of man, starting with an ape and eventually becoming a shredding guitarist. 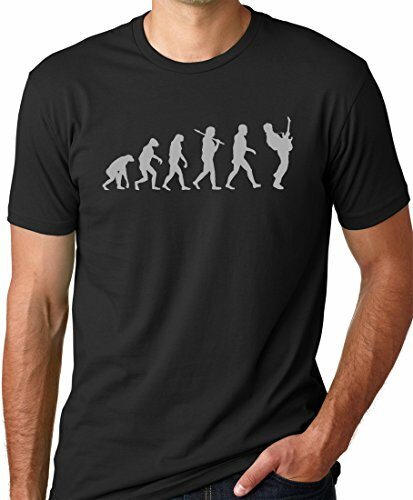 Humanity may not have followed the evolutionary paradigm depicted in the t-shirt, but it’s a great fashion statement. The shirt itself comes in a handful of different colors. This means that you can find the perfect shirt for your guitar player’s personality. Don’t worry about whether they will find the shirt funny — it’s more of a statement about who they are than it is about making someone else laugh at being passionate about music. 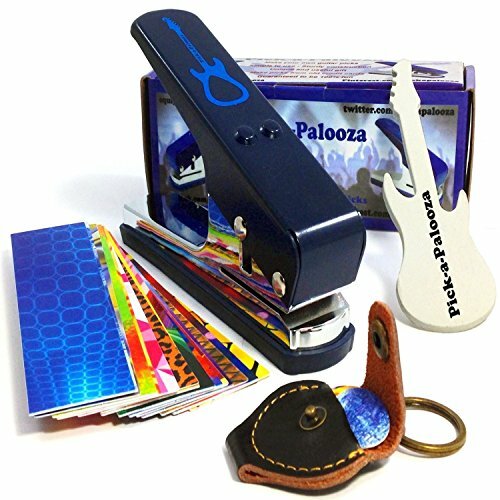 The Pick-a-Palooza DIY Guitar Pick Punch Mega Gift Pack is a great gift to the guitar player who loves to make their picks. Many guitar players are creative in other aspects of their life. This includes the hardware of their guitar playing. Making picks with a press isn’t very hard, and many players will appreciate the chance to express themselves even further than normal while playing and before playing. The pick-making process is very easy. Unfortunately, the swatches of plastic provided with the unit don’t exactly provide an infinite canvas for your guitar player’s creativity. Getting their ideal image printed onto a new piece of plastic will make punching future picks very easy, but the set doesn’t include many inspiring patterns right out of the box. Be prepared for your guitar player to need to invest a little bit of extra effort to get the ideal pick for their guitar playing. 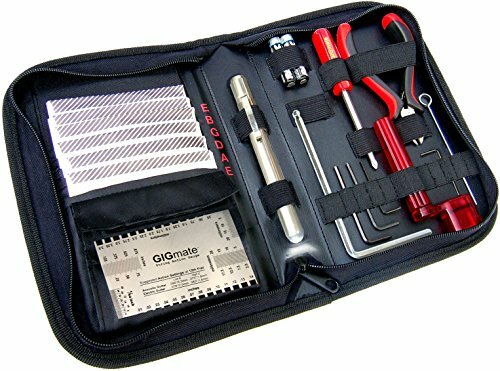 The GIGmate Guitar Tool Kit & String Organizer is a great mini-kit for your guitar player to use whenever they need to perform a bit of maintenance on their guitar. Guitar players need to tune and adjust their instruments all of the time. Typically, they don’t have a unified set of tools to do so. They often have messy conglomerations of their tools which can get lost or warped if they are not careful. Giving your guitar player the gift of this kit will solve that problem. The kit itself is valuable because it will give your guitar player an idea of the things that they should have in their toolkit. The tools in the kit will probably be of some use to your guitarist, but they will likely replace many of the tools with their preferred items. This means that you are giving them a gift they can modify to their liking — an excellent proposition. 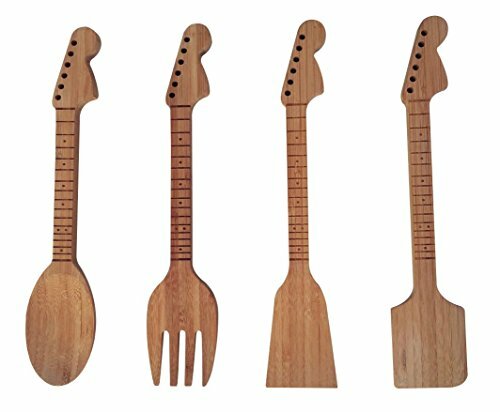 The Bamboo Guitar Neck Shaped Kitchen Utensil Set is a great gift for guitar players that have a culinary flair. Guitarists tend to be very creative, and they love to talk about their craft. They also love to hybridize their craft with other creative endeavors, which is exactly what this utensil set enables. The utensils themselves are comfortable to use and are doubtlessly functional when it comes to slinging salads or mashed potatoes. You can probably find more durable kitchen utensils out there, but it will be hard to find utensils which are as creative as these. 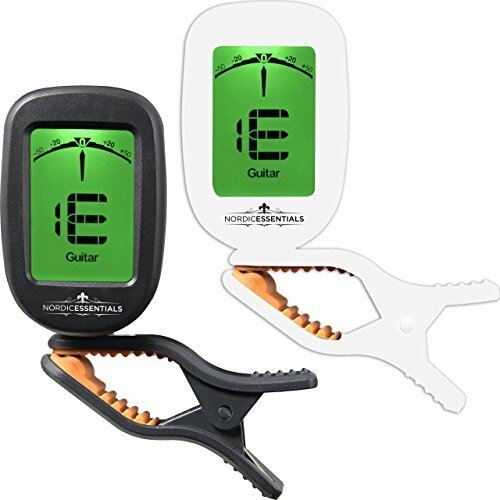 This Nordic Essentials Guitar Tuner 2 Pack is an electric guitar tuner set which your guitar player will find is a substantial upgrade over tuning by ear. Especially if your guitar player is starting out, they will need to tune their guitar frequently. Despite this need, they may not be very good at tuning the guitar because of how sensitive the differences between tones may be. 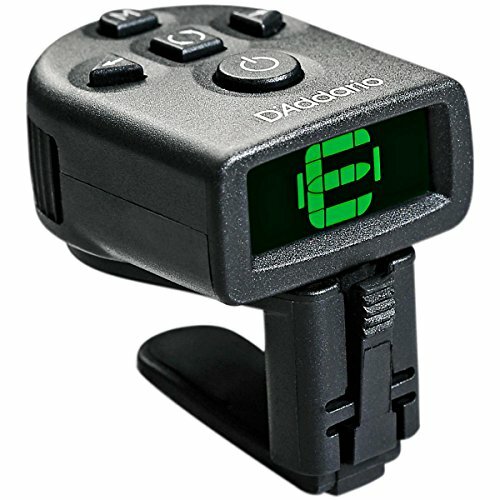 So, with the help of this electronic tuner, your guitar player won’t need to rely as much on their ears to tune their guitar. While this is not a helpful feature for veteran guitarists, those who are starting out can correlate the perfect tone with the indicator’s reading, which will help them to learn. The Nordic Essentials Guitar Capo 2 Pack is a great toolset for guitarists who need clamps. You should probably ask your guitarist if they need something similar to this set before you purchase it. If they need it, they’ll be very grateful, but if they don’t know how to use it, you will have given them something useless. The D’Addario NS Micro Clip-On Tuner is another option which your guitar player will love because it will help them to find the perfect pitch while offering them a few advanced features. This tuner is excellent because it can be used for either a quick tune-up or an in-depth tuning modification session. Your guitarist will not need to know that much about tuning to make use of these advanced features. The only downside is that the unit is a little bit bulky in comparison to other guitar tuners, but it has more features to compensate. 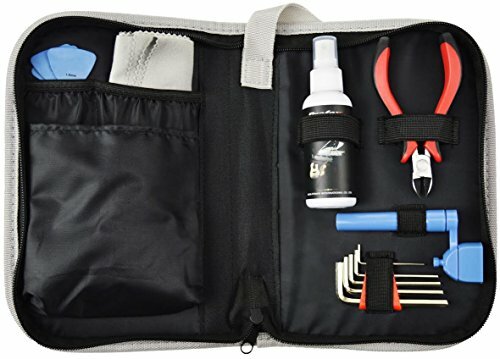 This set of Guitar Tools for Changing Guitar Strings is a minimalistic and lightweight guitar maintenance set that your guitar player will love to carry with them wherever they go. Unlike many other guitar toolsets, this set doesn’t try to have everything. It covers the bare essentials, which includes hex keys and polish spray. Your player can also use the string cutter if they desire. More advanced tuneups will be beyond this kit, but your guitar player is very unlikely to be confused by superfluous tools, which is great for beginners. Now that you know about ten of the top gifts for guitar players, it’s time to send your choice to your favorite friend who loves to play the guitar. Make sure you talk with your guitarist about what they need before making your purchase to make sure that they get something that they will love. If you succeed, they will think about you every time they pick up the guitar for a strum.